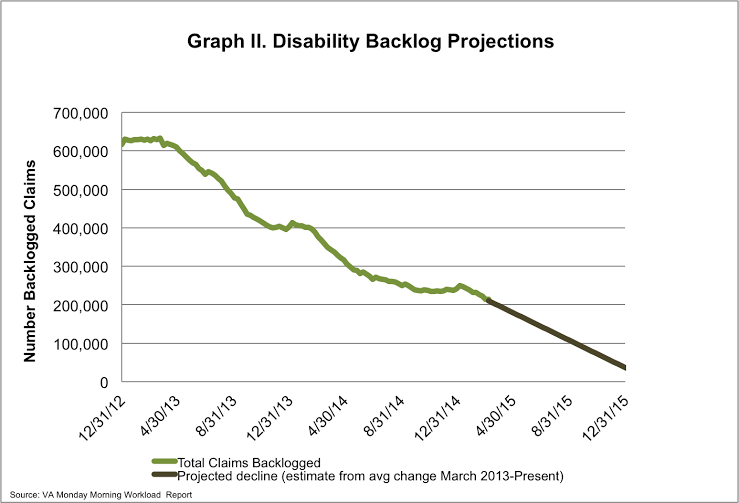 Yesterday the VA reported that the disability compensation claims backlog (1) increased by about 1000 claims the week of March 1-7, 2015. A total of nearly 475,620 claims are pending a decision, with 214,499 backlogged (defined as a claim that has been awaiting a decision for more than 125 days). This means that 45% of the claims pending have been pending for over 125 days. The Department also reported 293,687 appeals pending. 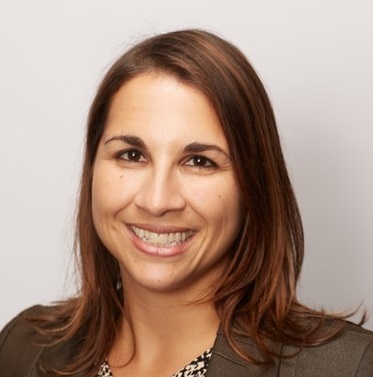 Last week, IAVA’s research term received a question wondering whether there’s concern that, given the backlog is going down while the number of appeals is going up, that the backlog is simply being shifted from the claims process to the appeals. A different way of asking this question is to wonder whether the drive to end the backlog is leading to quantity over quality in adjudicating VA disability claims. There are many, including members of Congress who have voiced this concern. This is a tough question to answer, but over the next few weeks I’m going to do my best to talk about some of the issues interweaved into what seems to be a pretty straightforward question. I can promise you, it’s not. A previous blog focused on understanding the accuracy rating tracked by the VA. This is one part of the question. Another part is considering the annual rate at which appeals are being filed. The idea being that if the VA is seeing a steady rate of appeals each year, then there’s less cause for concern that the increase in the number of appeals is due to a change in the quality by which claims are adjudicated. The rate of appeals had held steady at about 10 percent over the last few years (as determined by the number of Notice of Disagreements filed each year). The rate of appeals received by the Board of Veterans Appeals has also remained pretty steady, fluctuating between 4-5 percent since FY 2010. 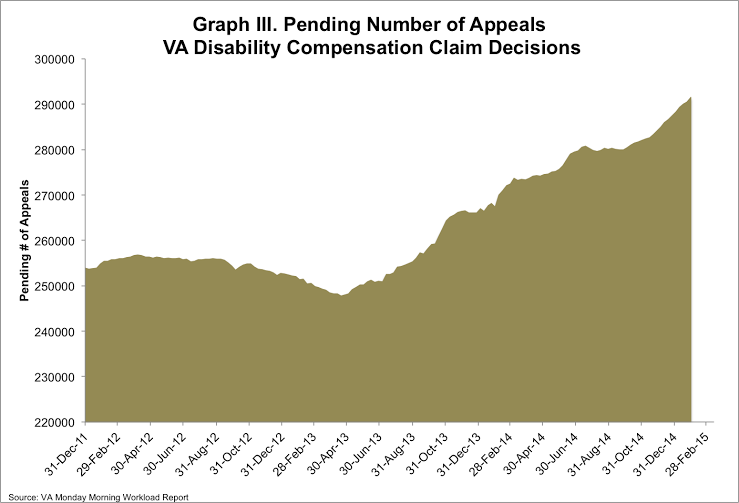 What is changing is the number of appeals, and this is at least in part due to the VA processing more claims annually. From 2012 to 2014 the number of completed disability claims rose from one million to 1.3 million. In that same timeframe, the number of appeals actually decreased 0.5 percent during 2012 to increasing 5 percent in 2013 and another 8 percent in 2014 (see graph III). One would expect that with more completed claims, the VA will continue to see more decisions appealed. So to keep up with demand, the answer largely rests with resourcing. Think about the private sector. As a company receives more business, it hires more employees and introduces more efficient processes to support that increased demand. As the VA received more customers, it will need more employees and more efficient processes to support its growing demand. This means a system where employees are not shifted from task to task dependent upon what area is most behind in its work (a method in use now to support current demand). It means having the appropriate resourcing to insure that each area has the appropriate systems and supports in place to meet its demand without falling behind. This will be critical to insuring that once that VA backlog finally ends, it also never returns. 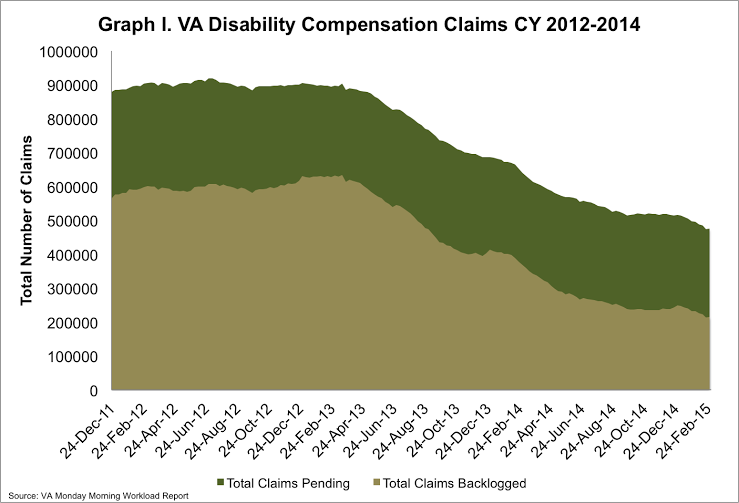 1) IAVA continues to track and report backlogged claims to include claims not counted in the VA’s Rating Bundle. IAVA does this because we believe that claims from all veterans and their families should be included in the goal to end the VA Backlog by 2015.